Opened last Friday evening, the park and avenue were built by a consortium of local firms at a cost of six million euro and 16 months of works. Last Friday, December 12, was no ordinary day in San Pedro Alcántara. The date will go down in the history books to record the opening of a project that has transformed the image of the area and improved facilities for local residents. These residents, however, have had to put up with 16 months of roadworks. The project, worth six million euro, has transformed an area of 55,000 square metres that were once occupied by the busy main road. Last Friday the mayor of Marbella, Ángeles Muñoz, officially inaugurated the area that has been christened the San Pedro 'bulevar', or 'boulevard', and was built by a temporary consortium formed by local firms Bonifacio Solís and Comonsa. The aim of the local authorities was to create a meeting point for local people as well as an attraction for tourists. This in turn is expected to provide a much-needed boost to local businesses. Water features heavily in the new park, and the gardened areas boast aromatic plants and Mediterranean species. Taking centre stage, however, is the 300-metre footbridge made from 150 tonnes of steel. Its undulating design is the work of San Pedro architect, Juan Antonio Fernández, who has called his walkway 'Un Mar de Sensaciones'. The raised walkway represents the main objective of the new area: to open up San Pedro to the sea. For years, the northern area of the town, the most densely populated, was separated from the south side. The San Pedro tunnel, which opened in 2012, provided the opportunity to do away this north-south divide. As well as the different designs of water features, the boulevard includes six children's play parks. An artificial ice skating rink also forms part of the park although it is not yet open to the public. New amenities include three bars with terraces; two of these are already operating, and the third will open in the new year. The entire area offers a Wi-Fi connection thanks to two information terminals which also provide useful details about the town's services and facilities. There is also a tourist information office. Visitors are reminded of San Pedro's history as an agricultural village by a sculpture representing sugar cane in one of the gardens. 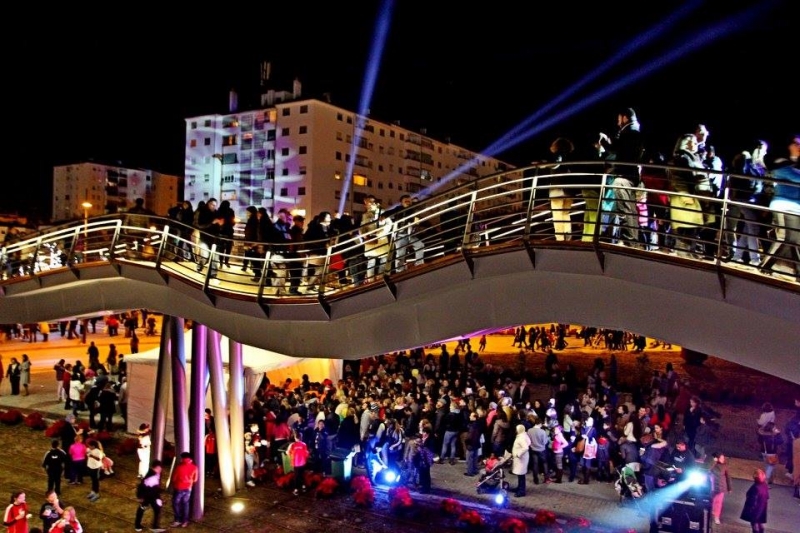 The local councillor for Public Works, Javier García, said that the designers tried to symbolise the connection with the origins of the town and the sea, using the bridge. "From its highest point you can see the Ingenio, the seafront and the street in the middle, turning a problematic point into the strong point of the project, bringing order, not just to the park, but also to the town," he said. The park has 311 parking spaces for cars, 81 for motorcycles, 70 for bikes, and nine for coaches, not many considering that an area of 800 square metres has been reserved for a food market in the future.